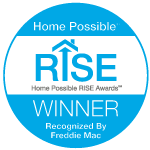 Mountain West Financial was proudly named a 2018 RISE winner by Freddie Mac for the fastest growth in the Freddie Mac Home Possible loan program. Whether you're looking to refinance out of a FHA loan, change the rate or term of an existing loan, or even take cash out with the equity in your home, you may be interested in a Conventional Refinance. Looking for loan amounts up to $3 Million? Jumbo Loans are the perfect solution with plenty of options and loans starting with as little as 15% down. Our investor options allow Investors may have up to 10 financed properties. Teachers, Firefighters, Police, and state employees you may be eligible for CalPATH & PATH, Mountain West Financial's exclusive home loan program, our way of saying thank you, to those our local communities who give so much. Don't want to risk rates raising while you're searching for your home? House Hunter is Mountain West Financial's lock program that allows you to lock in a rate today and not be subject to market volatility. If rates are lower once you find your home, you can float down to the new lower rate, if rates are higher, you keep your initial rate.